Тема: ЖИВОТНЫЕ. 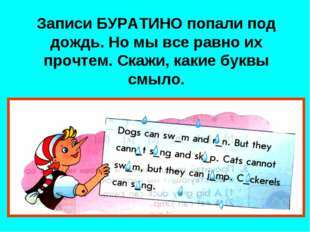 Употребление глагола CAN. 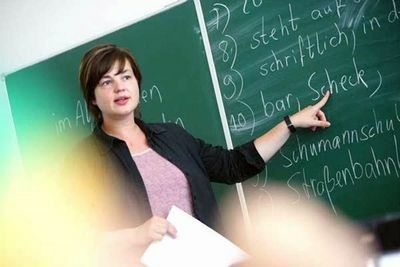 Цели: Углубление знаний о животных, их качествах, внешности. 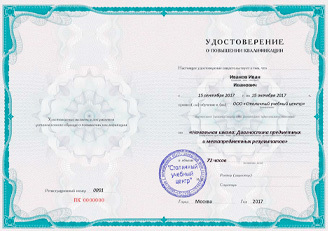 Развитие навыков монологической и диалогической речи. Воспитание любви к животным. Look at the picture! 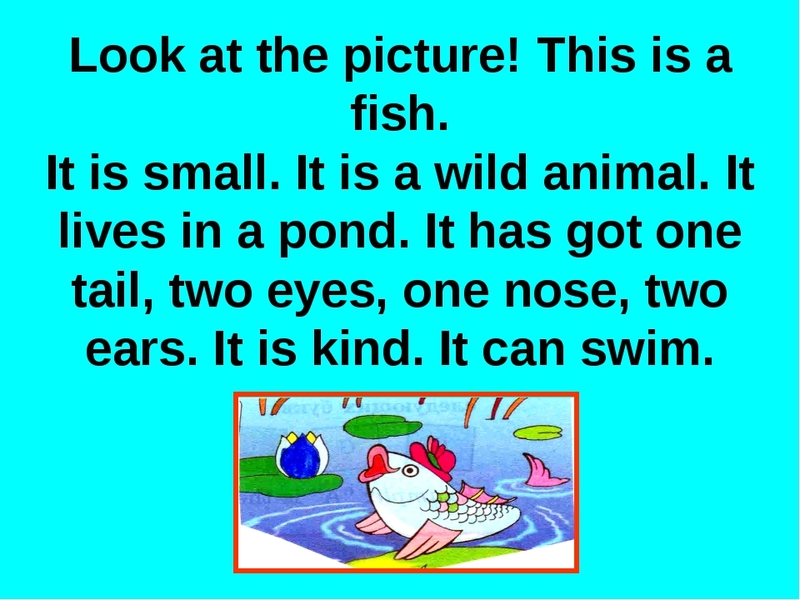 This is a fish. It is small. 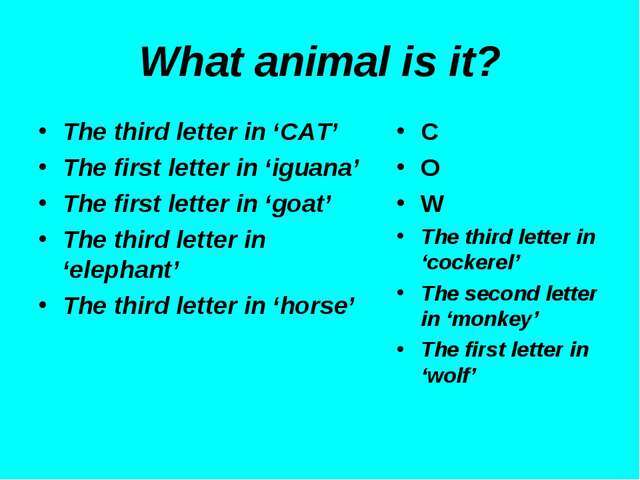 It is a wild animal. 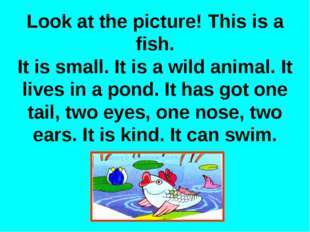 It lives in a pond. 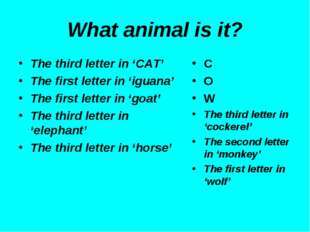 It has got one tail, two eyes, one nose, two ears. It is kind. 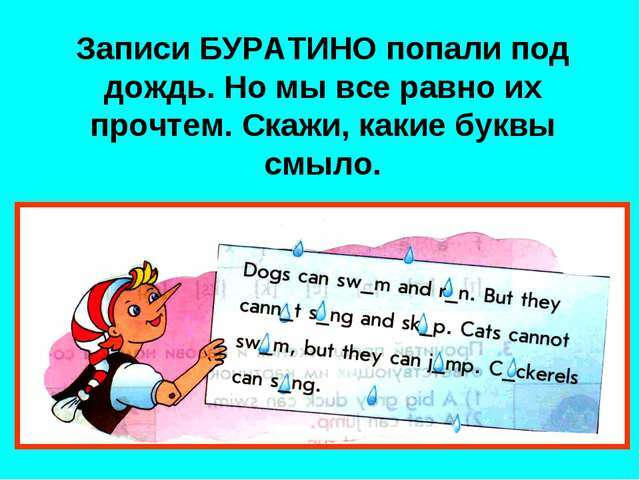 It can swim. 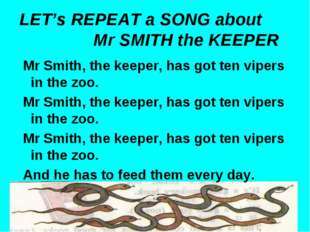 LET’s REPEAT a SONG about Mr SMITH the KEEPER Mr Smith, the keeper, has got ten vipers in the zoo. Mr Smith, the keeper, has got ten vipers in the zoo. 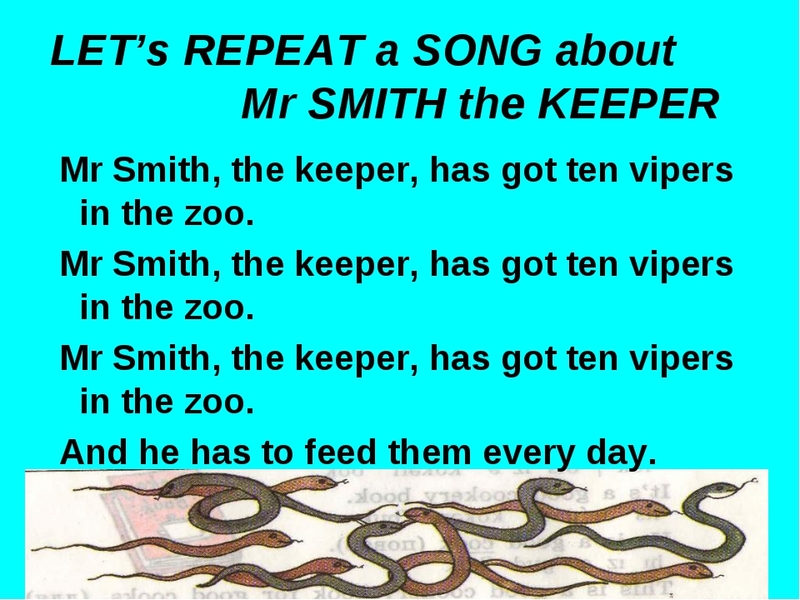 Mr Smith, the keeper, has got ten vipers in the zoo. And he has to feed them every day. 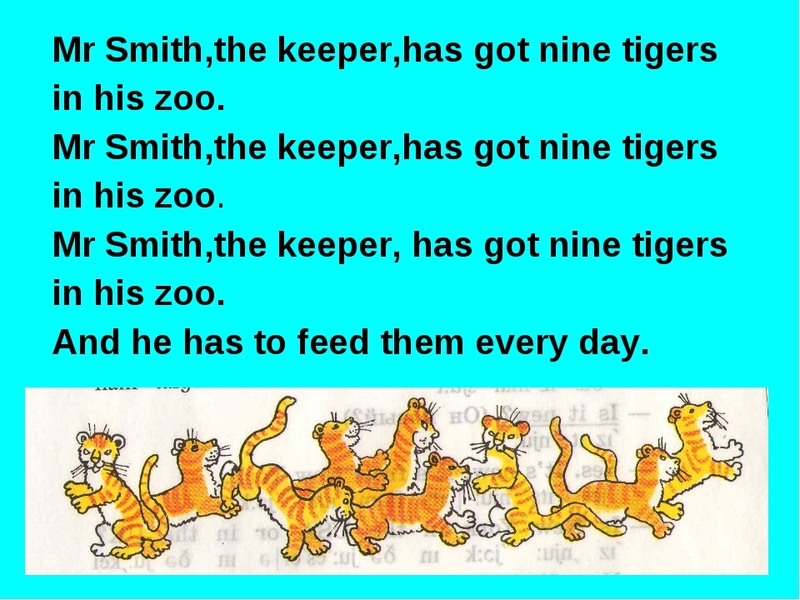 Mr Smith,the keeper,has got nine tigers in his zoo. Mr Smith,the keeper,has got nine tigers in his zoo. 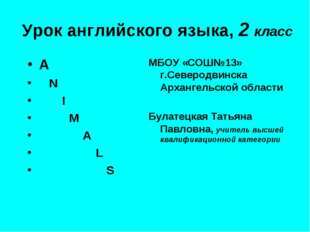 Mr Smith,the keeper, has got nine tigers in his zoo. And he has to feed them every day. 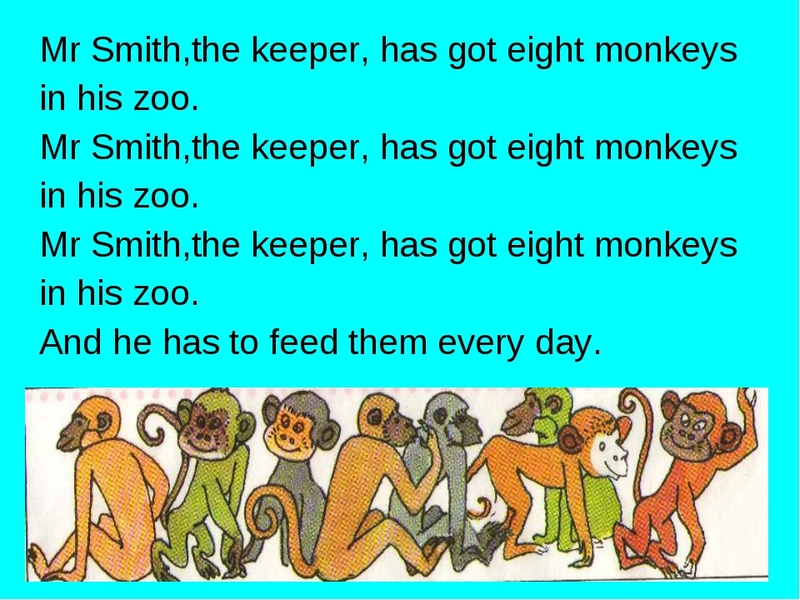 Mr Smith,the keeper, has got eight monkeys in his zoo. Mr Smith,the keeper, has got eight monkeys in his zoo. 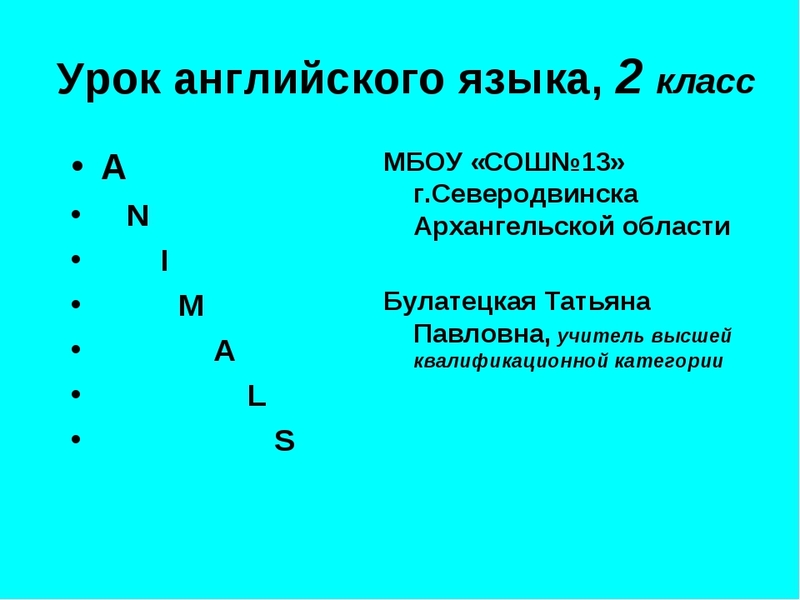 Mr Smith,the keeper, has got eight monkeys in his zoo. And he has to feed them every day. Mr Smith,the keeper, has got seven ravens in his zoo. 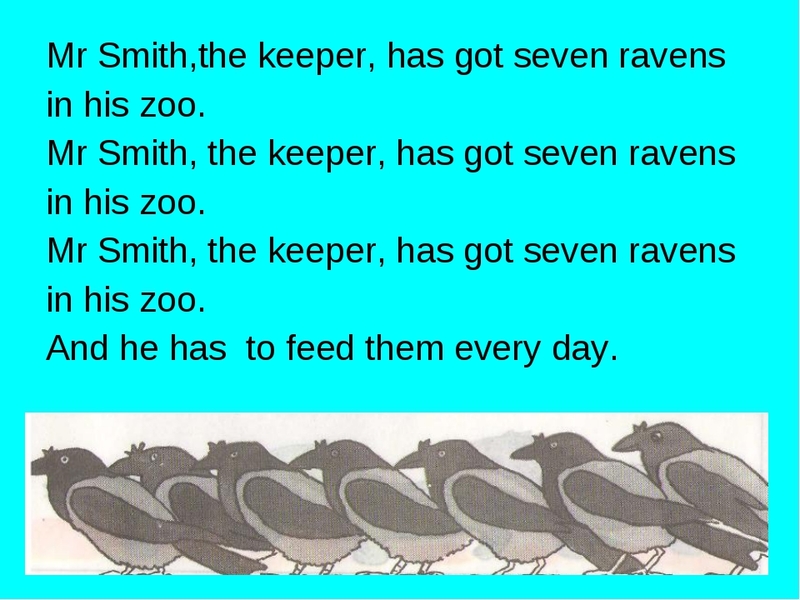 Mr Smith, the keeper, has got seven ravens in his zoo. Mr Smith, the keeper, has got seven ravens in his zoo. And he has to feed them every day. 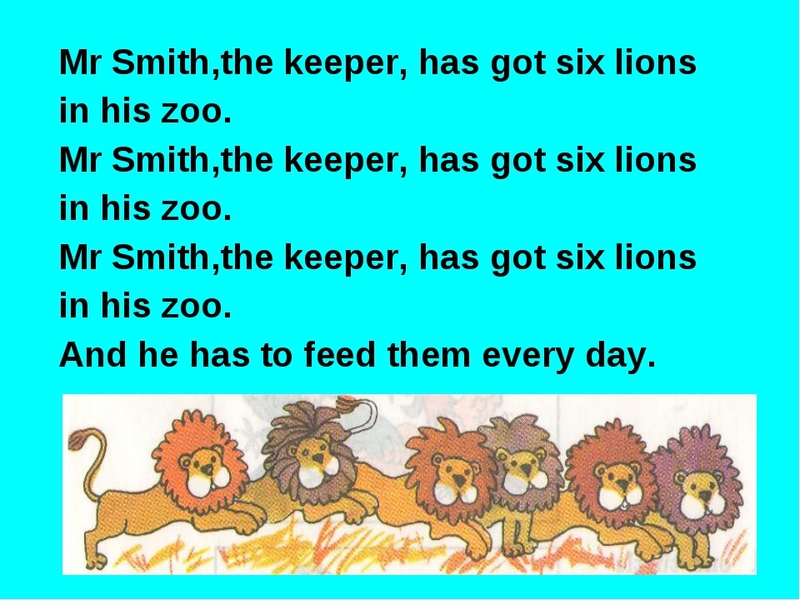 Mr Smith,the keeper, has got six lions in his zoo. Mr Smith,the keeper, has got six lions in his zoo. Mr Smith,the keeper, has got six lions in his zoo. And he has to feed them every day. Mr Smith,the keeper, has got five llamas in his zoo. Mr Smith,the keeper, has got five llamas in his zoo. 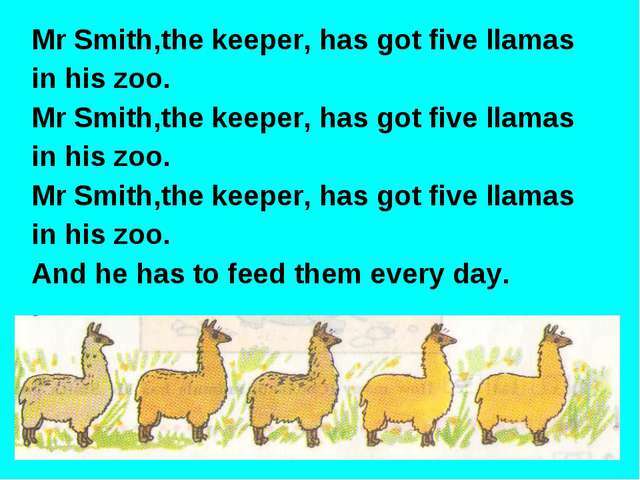 Mr Smith,the keeper, has got five llamas in his zoo. And he has to feed them every day. 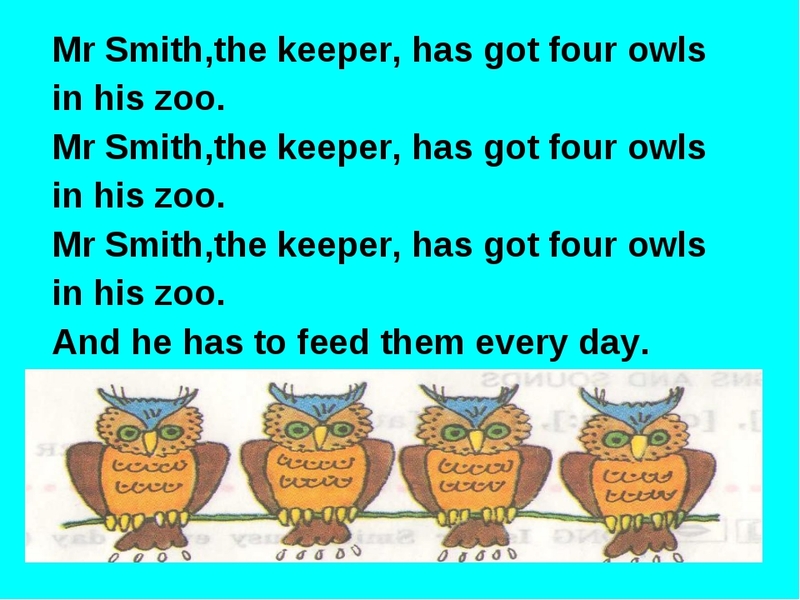 Mr Smith,the keeper, has got four owls in his zoo. Mr Smith,the keeper, has got four owls in his zoo. 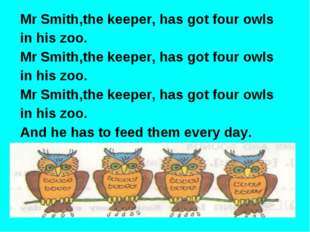 Mr Smith,the keeper, has got four owls in his zoo. And he has to feed them every day. Mr Smith,the keeper, has got three iguanas in his zoo. Mr Smith,the keeper, has got three iguanas in his zoo. 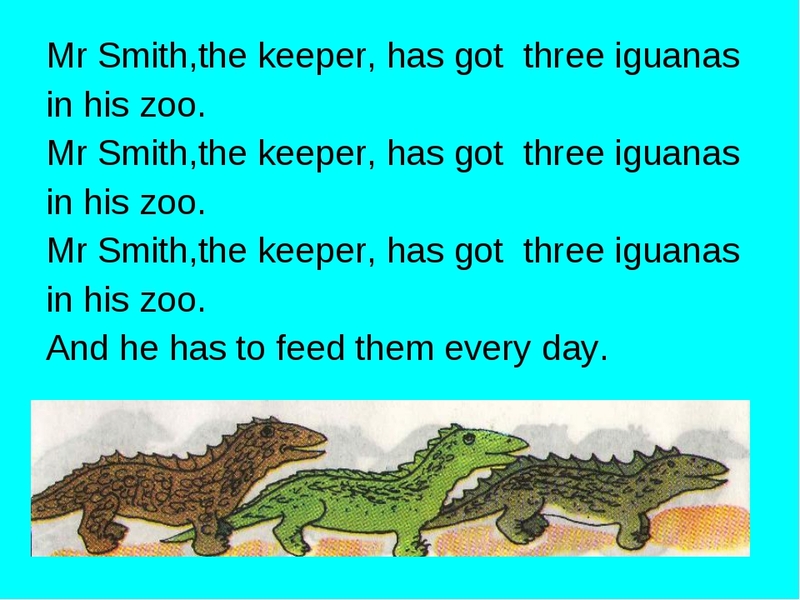 Mr Smith,the keeper, has got three iguanas in his zoo. And he has to feed them every day. Mr Smith,the keeper, has got two parrots in his zoo. Mr Smith,the keeper,has got two parrots in his zoo. 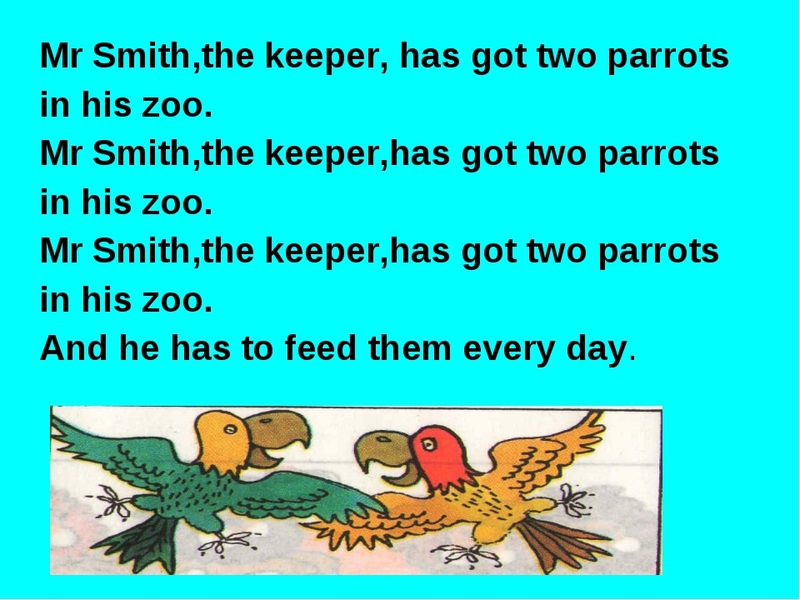 Mr Smith,the keeper,has got two parrots in his zoo. And he has to feed them every day. 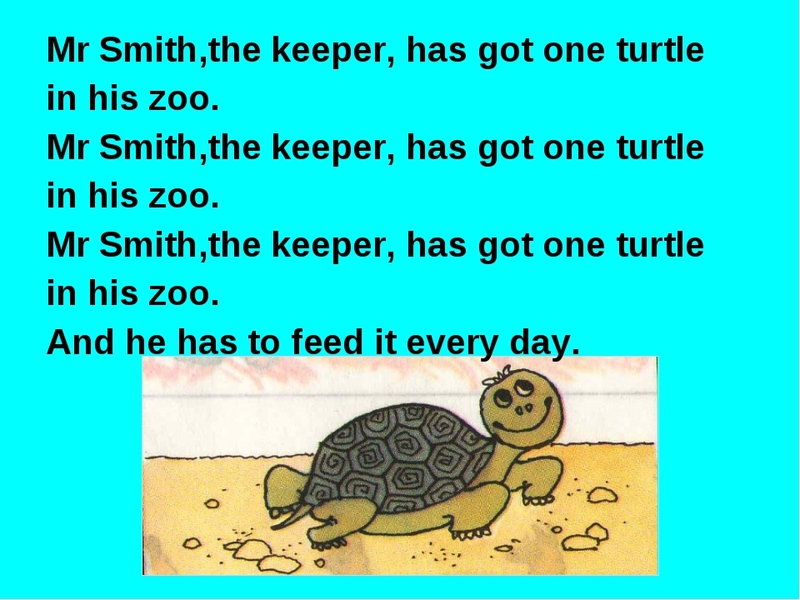 Mr Smith,the keeper, has got one turtle in his zoo. Mr Smith,the keeper, has got one turtle in his zoo. Mr Smith,the keeper, has got one turtle in his zoo. And he has to feed it every day. 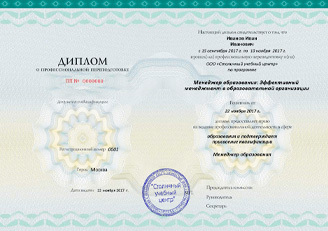 Записи БУРАТИНО попали под дождь. Но мы все равно их прочтем. Скажи, какие буквы смыло. 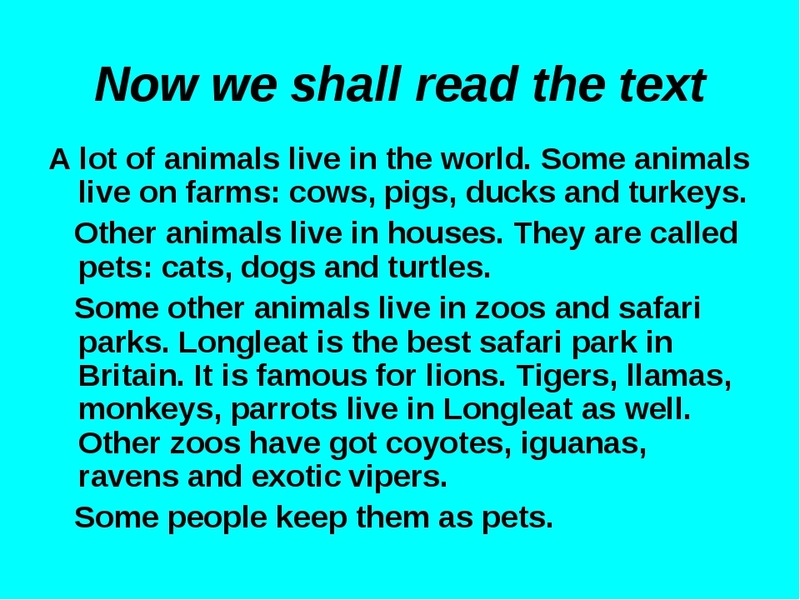 Now we shall read the text A lot of animals live in the world. 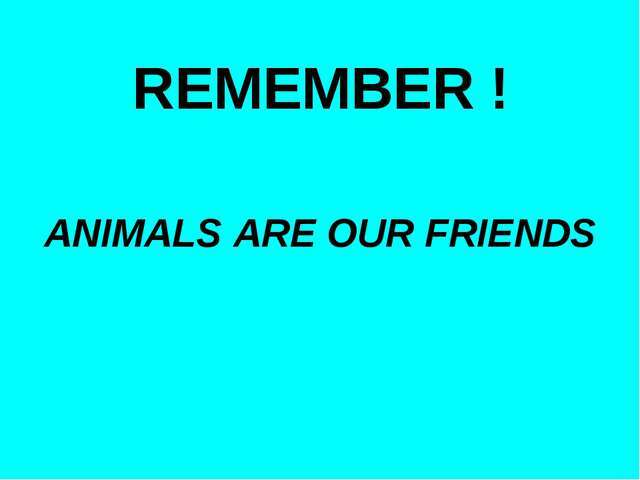 Some animals live on farms: cows, pigs, ducks and turkeys. Other animals live in houses. 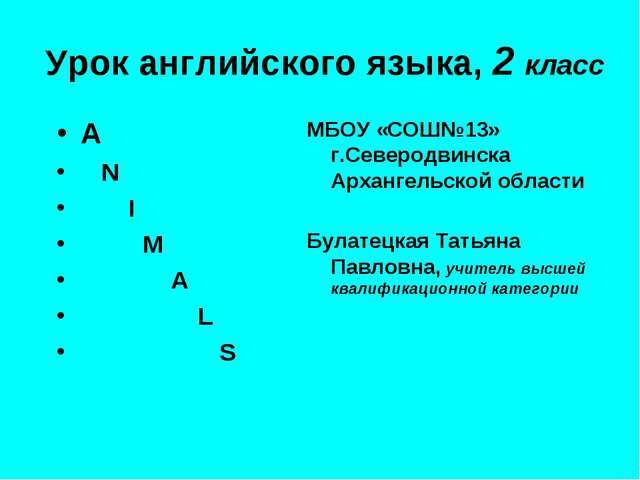 They are called pets: cats, dogs and turtles. Some other animals live in zoos and safari parks. 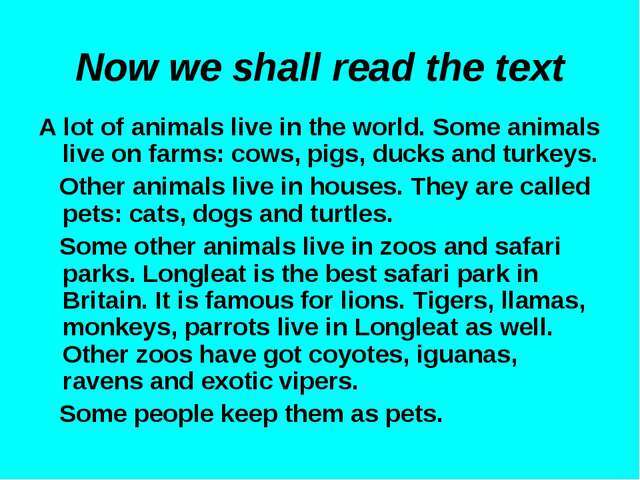 Longleat is the best safari park in Britain. It is famous for lions. 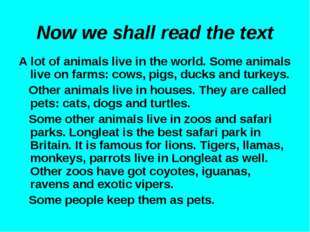 Tigers, llamas, monkeys, parrots live in Longleat as well. Other zoos have got coyotes, iguanas, ravens and exotic vipers. 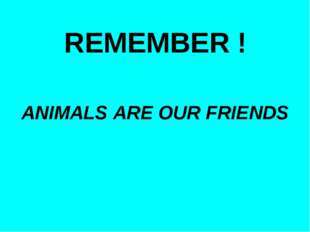 Some people keep them as pets. Answer the questions to the text: Who lives in the world? Where do some animals live? 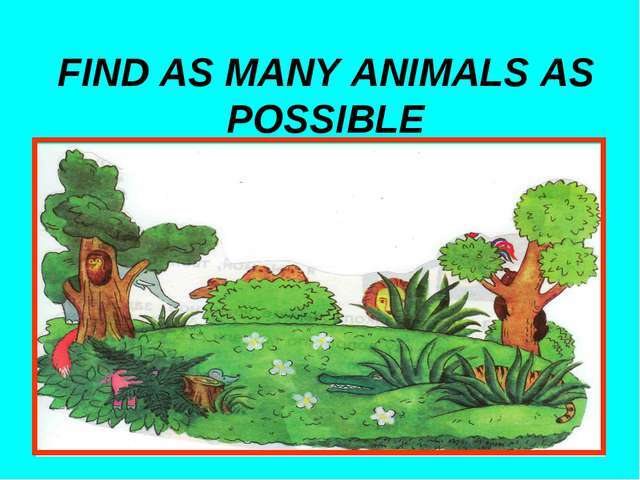 What animals live in houses? 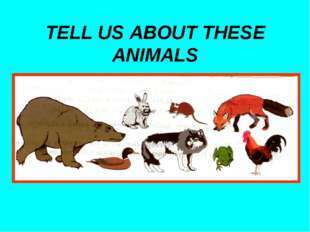 What animals live in zoos? 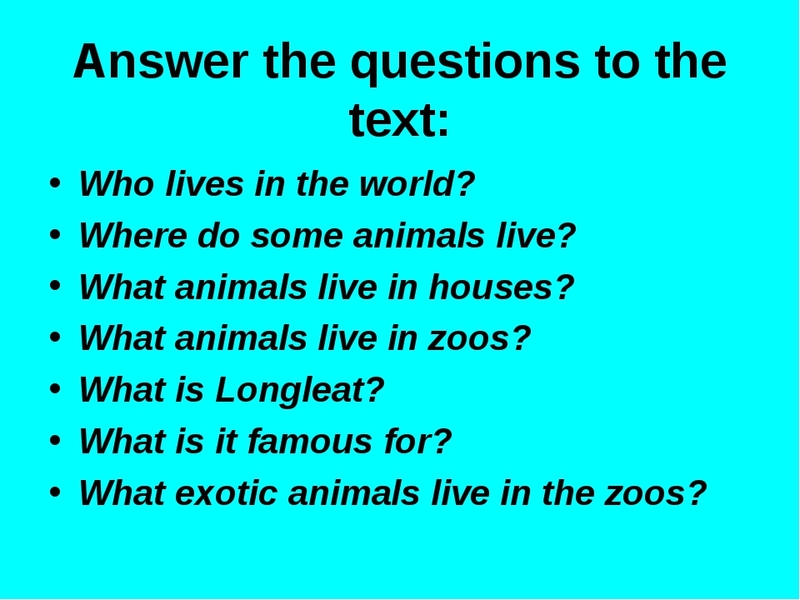 What is Longleat? What is it famous for? 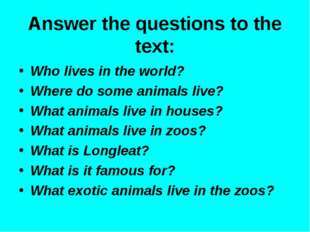 What exotic animals live in the zoos? 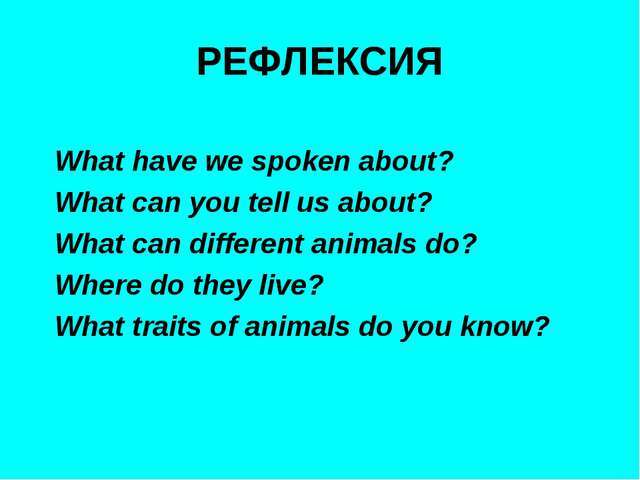 РЕФЛЕКСИЯ What have we spoken about? 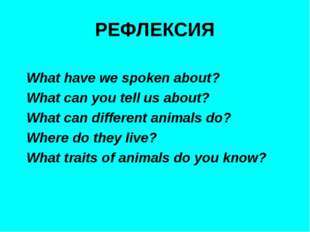 What can you tell us about? What can different animals do? Where do they live? What traits of animals do you know? 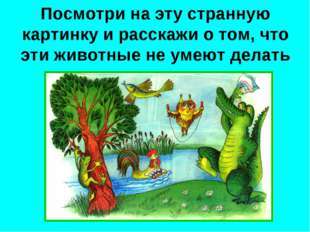 Изучив лексику по теме, получив навыки описания животных, зная возможности и умения разных животных, ребята с большим удовольствием покажут полученные навыки и умения на обобщающем уроке. Песня о владельце зоопарка мистере Смитте, которую ребята исполнят вместе, добавит уверенности в полученных знаниях. На уроке используются разные задания развивающего характера. Ребята будут читать, говорить, отвечать на вопросы. 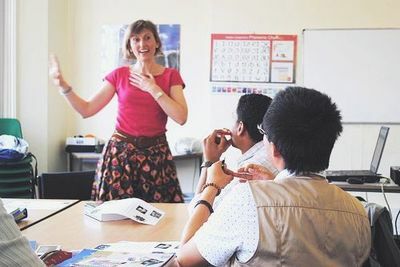 Творческая активность и размышления учащихся - главное достижение урока. 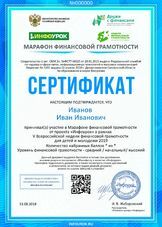 Презентация, ее яркие картинки, музыкальное оформление урока вызывают определенный интерес у ребят. 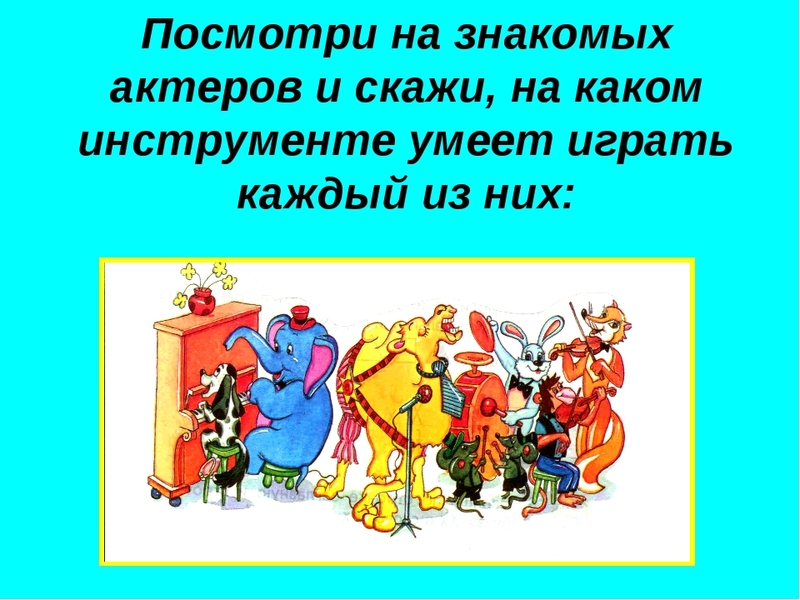 Итог урока - рефлексия, которую учащиеся учатся делать вместе с учителем.